lowercase L: The ITAlIAN STAllION is back! Was that Rocky II we saw in 1979, or could it have been Rocky LL? And might Rocky actually have had the lowercase L of the Tiger? Of course it was Rocky "2", as in the sequel to the 1976 film, Rocky, and he naturally had the Eye of the Tiger. 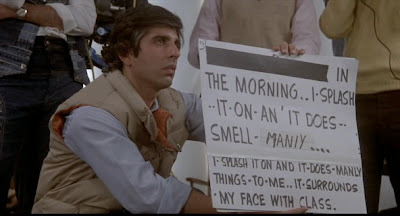 But I have my doubts, now that Gary C. pointed out this amazing scene in which Rocky Balboa struggles with cue cards while shooting a commercial for Beast Aftershave. In this humiliating scene, our beleaguered hero has great difficulty reading the simple lines, and claims in defiance that he is not "punchy", but merely has what you call a "relaxed brain". Having witnessed the brutal, repeated beatings that Apollo Creed previously unleashed on Rocky, we suspect this "relaxed brain" syndrome is more like brain damage. But after reading the "dummy boards" myself, I actually believe Rocky! When the cue card is revealed to us, we can finally see why he's having such difficulty reading his lines: "IN THE MORNING .. I SPLASH IT ON AN' IT DOES SMELL MANlY ...." That would cause me pause, too. Look closely, and you'll notice that not only is MANlY spelled with a lowercase L, but it is also in a different handwriting style than the rest of the cue card, and seems to be written on a corrective paper sheet overlay. Makes me wonder what horrific error the prop master was trying to cover up in the first place, if this new one was so much more acceptable. Watch the Rocky II Beast Aftershave scene on YouTube in all it's lowercase L glory!